Anonymous ruler of the city of Gorgippia in the Bosporan Kingdom, c. 180 AD. The Crimean Peninsula (at the time known as Taurica) was under partial control of the Roman Empire during the period of 47 BC to c. 340 AD. The territory under Roman control mostly coincided with the Bosporan Kingdom (although under Nero, from 62 to 68 AD; it was briefly attached to the Roman Province of Moesia Inferior). Rome lost its influence in Taurica in the mid third century AD, when substantial parts of the peninsula fell to the Goths, but at least nominally the kingdom survived until the 340s AD. Byzantium, the eastern continuation of the Roman Empire, later regained the Crimea under Justinian I. The Byzantine Greeks controlled portions of the peninsula well into the Late Middle Ages. Rome started to dominate the Crimea peninsula (then called Taurica) in the 1st century BCE The initial area of their penetration was mainly in eastern Crimea (Bosporus kingdom) and in the western Greek city of Chersonesos. The interior was only nominally under Roman rule. In ancient times Crimea was known as "Chersonesus Taurica", from the name of the Tauri, who were descendants of the Cimmerians. Many Greek colonists settled in Taurica: their most renowned colony was Chersonesos. In 114 BCE the Bosporus kingdom accepted the overlordship of Mithridates VI Eupator, king of Pontus, as a protection from tribes of Scythians. For nearly five centuries after the defeat of Mithridates by the Roman Pompey, Crimea was under the suzerainty of Rome. The main Roman settlement was Charax, a castrum probably built around 60–65, and the main naval Roman base was in Chersonesos. When the Romans arrived at Taurica, they set up their camp and built a fortress and a temple of Jupiter Dolichenus on the coast of the harbor of Balaklava, then called Symbolon Limen. Tiberius Julius Aspurgus (8 BC – 38) founded a line of Bosporan Kings which endured with some interruptions until 341. Originally called Aspurgus, he adopted the Roman names "Tiberius Julius" because he received Roman citizenship and enjoyed the patronage of the first two Roman Emperors, Augustus and Tiberius. All of the following kings adopted these two Roman names followed by a third name, mostly of Pontic, Thracian or Sarmatian origin. Bosporan kings struck coinage throughout the kingdom period, which included gold staters bearing portraits of the respective Roman Emperors. In 67, Emperor Nero prepared a military expedition to conquer for Rome all the northern shores of the Black Sea from the Caucasus to what is now Romania-Moldavia, but his death stopped the project. For this reason he probably put Taurica under direct Roman rule and created the Charax castrum. He extended the Roman province of Lower Moesia to Tyras, Olbia and Taurica (the peninsula of Crimea). Taurica enjoyed a relative golden period under Roman leadership during the 2nd century CE, with huge commerce of wheat, clothing, wine and slaves. The prosperous merchant-towns (of Taurica), permanently in need of military protection amidst a flux of barbaric peoples, held to Rome as the advanced posts to the main army....(during that century) Roman troops were stationed in the peninsula, perhaps a division of the Pontic fleet, certainly a detachment of the Moesian army, (other garrisons in Panticapaeum and Chersonesos); their presence even in small numbers showed to the barbarians that the dreaded legionary stood behind (the Bosporanum Regnum). The region was temporarily conquered by the Goths in 250. The last client king of the Roman Empire in Taurica was Tiberius Julius Rhescuporis VI, who died in 342. Rhescuporis seems to have minted coins as late as 341, indicating that there was some extent of political control over the remnants of the kingdom at this point. The remnants of the Bosporan kingdom were finally swept away with the invasion of the Huns in 375/6. 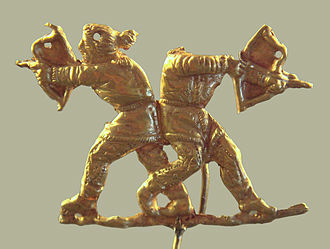 The largest Roman military settlement in Crimea was Charax. It was sited on a four-hectare area at the western ridge of "Ai Todor", close to the modern Yalta castle of Swallow's Nest. When in 62–66 CE the Roman garrisons were installed in Taurica, Charax became one of their strongholds. 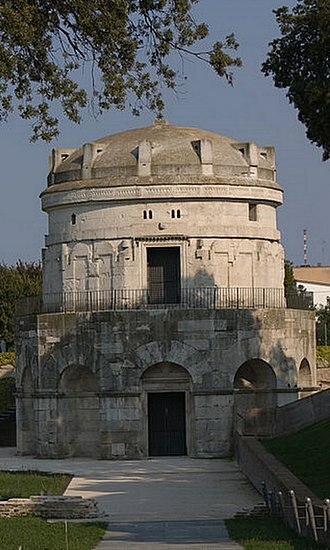 The Romans built a fortress and stationed a sub-unit (vexillatio) of the "Ravenna squadron". Charax was a very important strategic point, because it allowed the Romans to establish control over the navigation along the Crimean coast. The military camp was fully developed under Vespasian with the intention of protecting Chersonesos and other Bosporean trade emporiums from the Scythians. By the end of the 1st century, the Roman forces were evacuated from the Crimea peninsula. Several decades later the camp was restored by a vexillatio of the Legio I Italica: it hosted a detachment of the Legio XI Claudia at the end of the 2nd century. 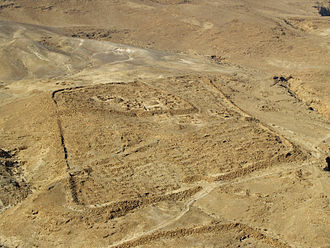 In this century, new stone walls were added to the fortress and a new Roman road was built, connecting Charax to Chersonesos. 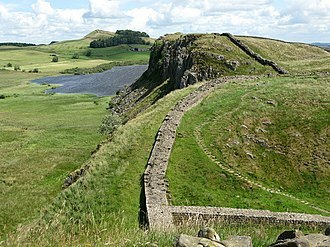 The camp was abandoned by the Romans at the end of the 3rd century. 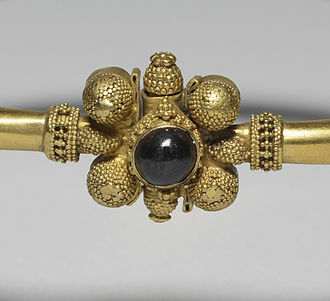 The Byzantine Empire again took control of the region under Justinian I. In the 6th century, probably at the end of the reign of Justinian I, the status of Roman Crimea changed. Taurica became the Province of Chersonesos, which also included Bosporos and the southern coast of Crimea. This enlargement of Byzantine Taurica resulted in the elevation of the ranks of its governors. 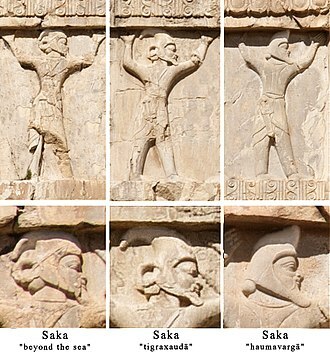 In the second half of the 6th century, the military and civil authorities in the region were entrusted to the military deputy, "doux Chersonos". Furthermore, the city of Chersonnesos was used by the Romans as a place of banishment: St. Clement of Rome was exiled there and first preached the Gospel. Another exile was Justinian II, who is said to have destroyed the city in revenge. Most of Roman Crimea fell under Khazar overlordship in the late 7th century. In the mid-8th century the rebellious Crimean Goths were put down by the Khazars and their city, Doros (modern Mangup), was occupied. A Khazar tudun (ruler) was resident at Chersonesos already in 690, despite the fact that this town was nominally subject to the Byzantine Empire. The Byzantine emperors controlled the southern shores of the Crimea peninsula until the 13th century. 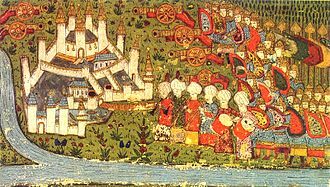 Control then passed to the Empire of Trebizond, one of the successor states to the Byzantine Empire after the sack of Constantinople in 1204. Another offshoot, the Principality of Theodoro, endured until 1475, when it was conquered by the Ottoman Empire. 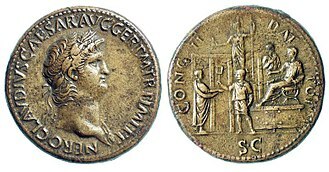 There are many series of Roman coins from the 1st century BCE to about 300, and also some from the Byzantine period. ^ Migliorati, Guido (2003). Cassio Dione e l'impero romano da Nerva ad Anotonino Pio: alla luce dei nuovi documenti. Vita e Pensiero. 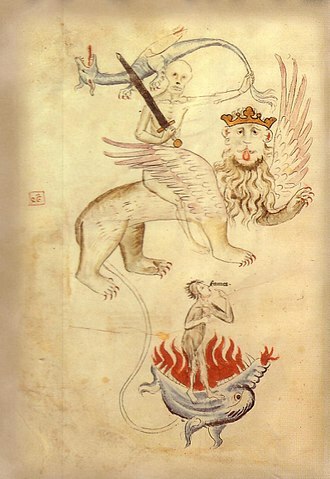 p. 6. ISBN 88-343-1065-9. ^ For other Roman settlements in the Crimea, see В.М. Зубарь "Таврика и Римская империя: Римские войска и укрепления в Таврике". Kiev, 2004. ^ Article on "Харакс" in the Great Soviet Encyclopaedia, 3rd edition, 1969–78. ^ Vasiliev, A.A. (1936). The Goths in the Crimea. Wikisource has the text of the 1911 Encyclopædia Britannica article Bosporus Cimmerius. Joseph Coleman Carter; Glenn Randall Mack, eds. (2003). Crimean Chersonesos: city, chora, museum, and environs. University of Texas at Austin. Institute of Classical Archaeology. ISBN 978-0-9708879-2-4. Fornasier, Jochen; Böttger, Burkhard (2002). 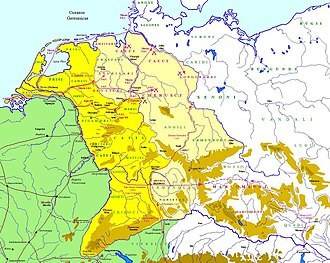 Das Bosporanische Reich: der Nordosten des Schwarzen Meeres in der Antike. ISBN 978-3-8053-2895-1. Theodor Mommsen; William Purdie Dickson (1996). The provinces of the Roman Empire, from Caesar to Diocletian. ISBN 978-0-7607-0145-4. Justinian I, traditionally known as Justinian the Great and Saint Justinian the Great in the Eastern Orthodox Church, was a Byzantine emperor from 527 to 565. During his reign, Justinian sought to revive the empires greatness, because of his restoration activities, Justinian has sometimes been called the last Roman in modern historiography. This ambition was expressed by the recovery of the territories of the defunct western Roman Empire. His general, swiftly conquered the Vandal kingdom in North Africa, the prefect Liberius reclaimed the south of the Iberian peninsula, establishing the province of Spania. 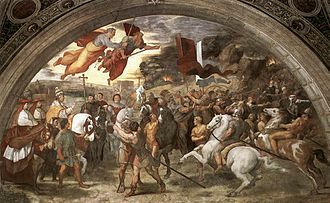 These campaigns re-established Roman control over the western Mediterranean, increasing the Empires annual revenue by over a million solidi, during his reign Justinian subdued the Tzani, a people on the east coast of the Black Sea that had never been under Roman rule before. 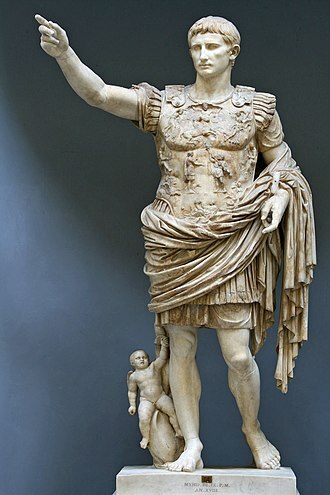 A still more resonant aspect of his legacy was the rewriting of Roman law, the Corpus Juris Civilis. His reign marked a blossoming of Byzantine culture, and his building program yielded such masterpieces as the church of Hagia Sophia, a devastating outbreak of bubonic plague in the early 540s marked the end of an age of splendour. 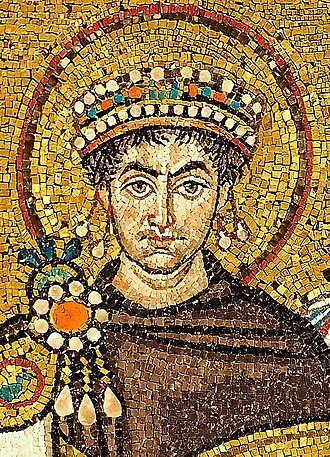 Justinian was born in Tauresium around 482, a native speaker of Latin, he came from a peasant family believed to have been of Illyro-Roman or Thraco-Roman origins. The cognomen Iustinianus, which he later, is indicative of adoption by his uncle Justin. 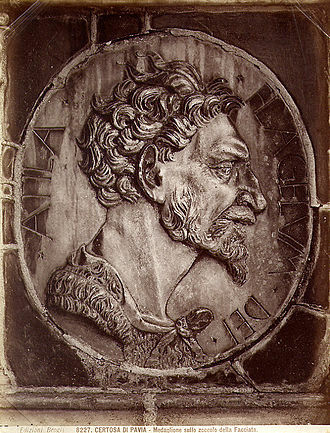 During his reign, he founded Justiniana Prima not far from his birthplace and his mother was Vigilantia, the sister of Justin. Justin, who was in the guard before he became emperor, adopted Justinian, brought him to Constantinople. As a result, Justinian was well educated in jurisprudence, Justinian served for some time with the Excubitors but the details of his early career are unknown. Chronicler John Malalas, who lived during the reign of Justinian, tells of his appearance that he was short, fair skinned, curly haired, round faced, another contemporary chronicler, compares Justinians appearance to that of tyrannical Emperor Domitian, although this is probably slander. When Emperor Anastasius died in 518, Justin was proclaimed the new emperor, during Justins reign, Justinian was the emperors close confidant. Panticapaeum was an ancient Greek city on the eastern shore of Crimea, which the Greeks called Taurica. The city was built on Mount Mithridat, a hill on the side of the Cimmerian Bosporus. It was founded by Milesians in the late 7th or early 6th century BC, the ruins of the site are now located in the modern city Kerch. During the first centuries of the existence, imported Greek articles predominated, pottery and metal objects, probably from workshops in Rhodes, Samos. Local production, imitated from the models, was carried on at the same time, Athens manufactured a special type of bowl for the city, known as Kerch ware. Local potters imitated the Hellenistic bowls known as the Gnathia style as well as relief wares—Megarian bowls, the city minted silver coins from the 5th century BC and gold and bronze coins from the 4th century BC. 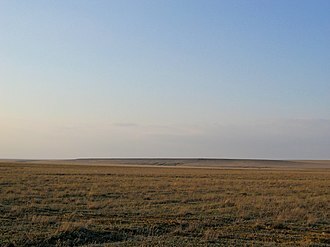 At its greatest extent it occupied 100 hectares, the Hermitage and Kerch Museums contain material from the site, which is still being excavated. Its economic decline in the 4th–3rd centuries BC was the result of the Sarmatian conquest of the steppes, the last of the Spartocids, Paerisades V, apparently left his realm to Mithridates VI Eupator, king of Pontus. Balaklava is a former city on the Crimean Peninsula and part of the city of Sevastopol. It was a city in its own right until 1957 when it was incorporated into the municipal borders of Sevastopol by the Soviet government. It is a center of Balaklava Raion that used to be part of the Crimean Oblast before it was transferred to Sevastopol Municipality. Balaklava has changed several times during its history. A settlement at its present location was founded under the name of Symbolon by the Ancient Greeks, during the Middle Ages, it was controlled by the Byzantine Empire and by the Genoese who conquered it in 1365. 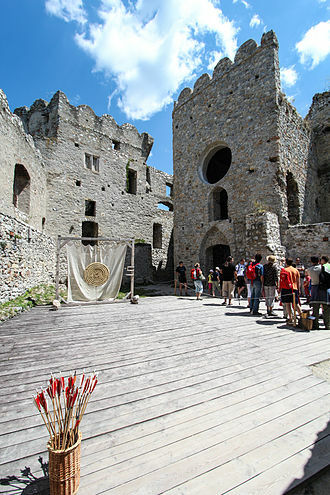 The Byzantines called the town Yamboli and the Genoese named it Cembalo, the ruins of a Genoese fortress positioned high on a clifftop above the entrance to the Balaklava Inlet are a popular tourist attraction and have recently become the stage for a Medieval festival. The fortress is a subject of Mickiewiczs penultimate poem in his 1825 cycle of Crimean Sonnets, in 1475 Cembalo City was conquered by Turks and they rename it to Balyk-Yuva which subsequently became Balaklava. During the Russo-Turkish War, 1768-1774, the Russian troops invaded Crimea in 1771, thirteen years later, Crimea was definitively annexed by the Russian Empire. After that, Crimean Tatar and Turkish population was replaced by Greek Orthodox people from the Archipelago. In 1787 the city was visited by Catherine the Great, the British poet Alfred, Lord Tennyson immortalized the battle in verse in his Charge of the Light Brigade. The balaclava, a knitted garment covering the whole head and neck with holes for the eyes and mouth, takes its name from this settlement. Also numerous towns founded in English-speaking countries in parts of the 19th Century were named Balaklava, during the Second World War, Balaklava was the southernmost point in the Soviet-German lines. In 1954 Balaklava, together with the whole Crimea, passed from Russia to Ukraine and it became part of the independent state of Ukraine in 1991. Today there are over 50 monuments in the dedicated to the remembrance of military valour in past wars, including the Great Patriotic War, the Crimean War. He is often considered the greatest ruler of the Kingdom of Pontus. Mithridates VI was a prince of Persian and Greek ancestry, Mithridates was born in the Pontic city of Sinope, and was raised in the Kingdom of Pontus. He was the first son among the children born to Laodice VI and his father, Mithridates V, was a prince and the son of the former Pontic monarchs Pharnaces I of Pontus and his wife-cousin Nysa. His mother, Laodice VI, was a Seleucid princess and the daughter of the Seleucid monarchs Antiochus IV Epiphanes, Mithridates V was assassinated in about 120 BC in Sinope, poisoned by unknown persons at a lavish banquet which he held. He left the kingdom to the joint rule of Mithridates mother, Laodice VI, neither Mithridates nor his younger brother were of age, and their mother retained all power as regent for the time being. Laodice VI’s regency over Pontus was from 120 BC to 116 BC, during his mother’s regency, he escaped from his mothers plots against him, and went into hiding. Mithridates emerged from hiding, returning to Pontus between 116 BC and 113 BC and was hailed as king and he removed his mother and brother from the throne, imprisoning both, becoming the sole ruler of Pontus. Laodice VI died in prison, ostensibly of natural causes, Mithridates Chrestus may have died in prison also, or may have been tried for treason and executed. Mithridates first married his younger sister Laodice, aged 16 and his goal was to preserve the purity of their bloodline, solidify his claim to the throne, to co-rule over Pontus, and to ensure the succession to his legitimate children. Mithridates entertained ambitions of making his state the dominant power in the Black Sea and he first subjugated Colchis, a region east of the Black Sea, and prior to 164 BC, an independent kingdom. He clashed for supremacy on the Pontic steppe with the Scythian King Palacus, the young king turned his attention to Anatolia, where Roman power was on the rise. He contrived to partition Paphlagonia and Galatia with King Nicomedes III of Bithynia and it soon became clear to Mithridates that Nicomedes was steering his country into an anti-Pontic alliance with the expanding Roman Republic. When Mithridates fell out with Nicomedes over control of Cappadocia, and defeated him in a series of battles, the next ruler of Bithynia, Nicomedes IV of Bithynia, was a figurehead manipulated by the Romans. 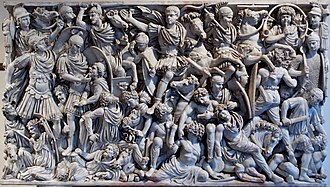 Citizenship in ancient Rome was a privileged political and legal status afforded to free individuals with respect to laws and governance. A citizen could, under certain circumstances, be deprived of his citizenship. Roman women had a form of citizenship. Though held in high regard they were not allowed to vote or stand for civil or public office, the rich might participate in public life by funding building projects or sponsoring religious ceremonies and other events. Women had the right to own property, to engage in business, and to obtain a divorce, marriages were an important form of political alliance during the Republic. 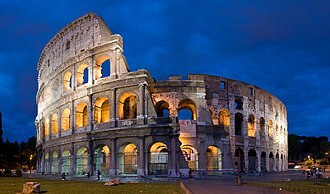 Client state citizens and allies of Rome could receive a form of Roman citizenship such as the Latin Right. Such citizens could not vote or be elected in Roman elections, slaves were considered property and lacked legal personhood. Over time, they acquired a few protections under Roman law, some slaves were freed by manumission for services rendered, or through a testamentary provision when their master died. Once free, they faced few barriers, beyond normal social snobbery, freedmen were former slaves who had gained their freedom. They were not automatically given citizenship and lacked some privileges such as running for executive magistracies, the children of freedmen and women were born as free citizens, for example, the father of the poet Horace was a freedman. The rights available to citizens of Rome varied over time, according to their place of origin. 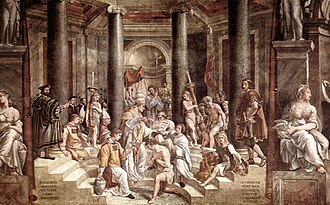 They varied under Roman law according to the classification of the individual within the state, various legal classes were defined by the various combinations of legal rights that each class enjoyed. However, the rights available to citizens with whom Roman law addressed were, Ius suffragiorum. Ius honorum, The right to stand for civil or public office, Ius commercii, The right to make legal contracts and to hold property as a Roman citizen. The rights afforded by the ius gentium were considered to be held by all persons, Ius migrationis, The right to preserve ones level of citizenship upon relocation to a polis of comparable status. The original wooden Swallow's Nest photographed by Sergey Prokudin-Gorsky. Overlooking the Cape of Ai-Todor, the romantic Swallow's Nest castle is situated on top of a 40-metre (130 ft) high Aurora Cliff.